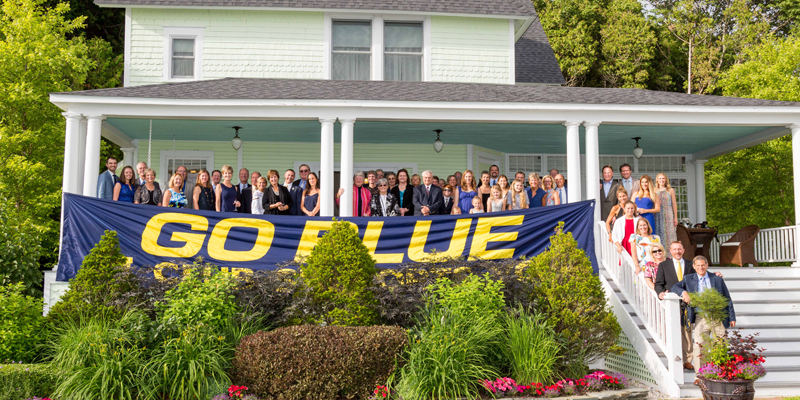 Reserve your room today and join Michigan Football Legend, Coach Jerry Hanlon, and the Letterwinners M Club at Grand Hotel July 19-21, 2019 for its 7th annual weekend getaway on Mackinac Island! Coach Hanlon joined the Michigan football staff in 1969 and was the only assistant coach to serve on Michigan's staff during all 21 years that Bo Schembechler was head coach. Hanlon was the team's offensive line coach for 17 years (1969–1981, 1988–1991) and the quarterback coach for six years (1982–1987). He was credited with developing 19 All-American offensive linemen at Michigan, including Dan Dierdorf, Reggie McKenzie, Jumbo Elliott and Greg Skrepenak. Join us at Grand Hotel for this special weekend and annual gathering for many. Enjoy time away meeting new and old friends affiliated with University of Michigan Athletics. The weekend will start Friday evening with a Welcome Reception at Stroh Cottage located next door to the hotel. Experience a beautiful evening on the Front Porch overlooking the Mackinac Bridge before dinner in the Main Dining Room. Throughout the weekend golf is included on The Jewel with a special golf tournament on Saturday afternoon. New this year, Saturday evening everyone is invited to a special cookout dinner and bocci ball and croquet tournament in the Grand Hotel Tea Garden. Breakfast is also included daily. The weekend package price is $989 (based on double occupancy). Children 9 and younger stay and eat for free, there are Children’s Programs for kids age five and older, and babysitting services available on request. For every package sold Grand Hotel will contribute $50 to the Letterwinners M Club! Please feel free to contact Ken Hayward (Baseball ’82-’85) with any questions at khayward@grandhotel.com or (517) 349-4600. The hotel's reservations department may also be reached at (800) 334-7263 or reservations@grandhotel.com. We look forward to seeing you there!